1. Rub the pork butts on all sides with the dry rub and allow them to come to room temperature (about 2 hours). 2. Using hardwood charcoal, build a small fire in one side of a covered cooker. Allow about 40 minutes for the charcoal to become completely caught. 3. Place the butts on the grill, making sure that they are not above any part of the fire. Cover and vent slightly. 4. Pull a comfortable chair and a cooler full of beer out of the house and sit next to the grill, adding small amounts of charcoal when needed to keep the fire just smoldering (about every 30 or 40 minutes or after each beer, whichever comes first). 5. Cook for 5 to 7 hours, or until the internal temperature is 165° to 170°F and the meat is super tender. 6. Remove the pork butts from the grill and chop or shred them, whichever you prefer. 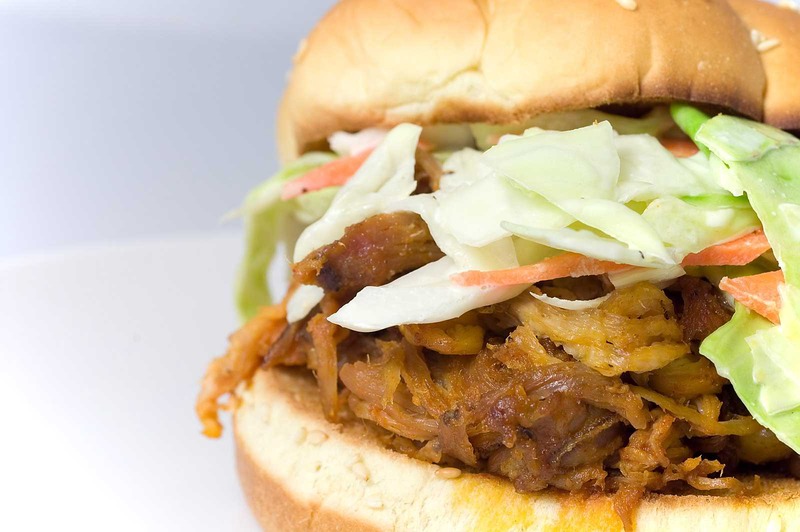 Mix the pork with the sauce to taste, and pile it onto the buns, topped with coleslaw. Garnish with a bottle of hot sauce. The real stuff. When I think of barbecue, this is what it is. The way to eat this incomparable sandwich is sitting at a picnic table south of the Mason-Dixon Line, with a bottle of Texas Pete close at hand, a tall, frosty beer open, and George Jones on the radio. What more need be said? This amount should serve about 15 people and will keep covered in the refrigerator for 3 to 4 days.